Foursquare this week launched its Explore feature on the web that was only available on its mobile app. In an effort termed as: “Personalized search for the real world”, the launch of this feature as a section on the Foursquare website shows that it is making a serious push into local search on the web. Another main feature – utilizing your friends’ behaviors and preferences to recommend things for you to do. Note the options in the bottom right. In addition to being able to simply explore new places you haven’t been to yet, you’re also able to easily search for places your friends have been to. The results will be shown on a map with places your friends have visited, how often they’ve been there, and what they’ve had to say about them, which already exists on countless other travel planning sites. Unlike most travel planning sites, Foursquare didn’t have to ask users to recommend things or make them enter data manually. This data was shared in real-time, giving it authenticity and lacking the sort of bias towards popularity frequently seen on other sites. Explore also searches the massive amount of data contained in Tips and Reviews left by users, enabling a user to free text search for places and recommendations such as ‘chic boutique hotel’ and really dig into what users think about particular places. Enabling users to easily find things they’ve previously expressed interest in is another important feature of Explore. Utilizing the “Save for later” feature, a user can easily bookmark spots in a city they wish to visit in the future. 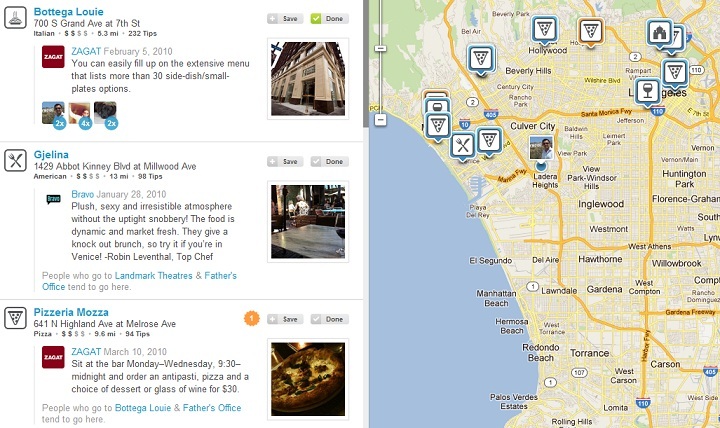 When visiting that city, Explore would allow the user to easily find spots they’ve bookmarked. This is in addition to Foursquare’s Radar feature, which can automatically alert you when you’re near a place you’ve saved.